Situated in the quiet beauty of rural Shropshire with views across 35 acres of gardens and woodland, Haughton Hall – dating back to 1718 – has been decorated with timeless style and features thirty-seven stunning bedrooms and suites, luxurious public areas and stylish dining in Oliver’s restaurant. Leisure facilities include a fishing lake, 9/18 hole Foot Golf Course and outdoor tennis court along with a leisure club with swimming pool, gym, sauna & steam room. 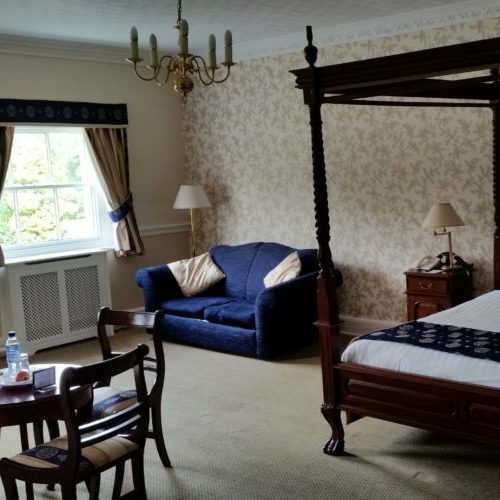 This gift voucher entitles two people to an overnight stay in a luxurious room with a four-poster bed and full English breakfasts in the morning. It also includes £25 each to spend in the restaurant where you can enjoy a relaxing meal in the Lounge Bar or Oliver’s Restaurant which offer everything from home cooked classics to gourmet delights as well as an extensive wine list and a fully stocked bar. All drinks are an additional cost. Reservations should be made in advance by calling 01952 468 300. Gift vouchers are non-refundable but transfers are permitted at least 48 in advance.